This post is continuation of my affair with Maharashtrian cuisine. 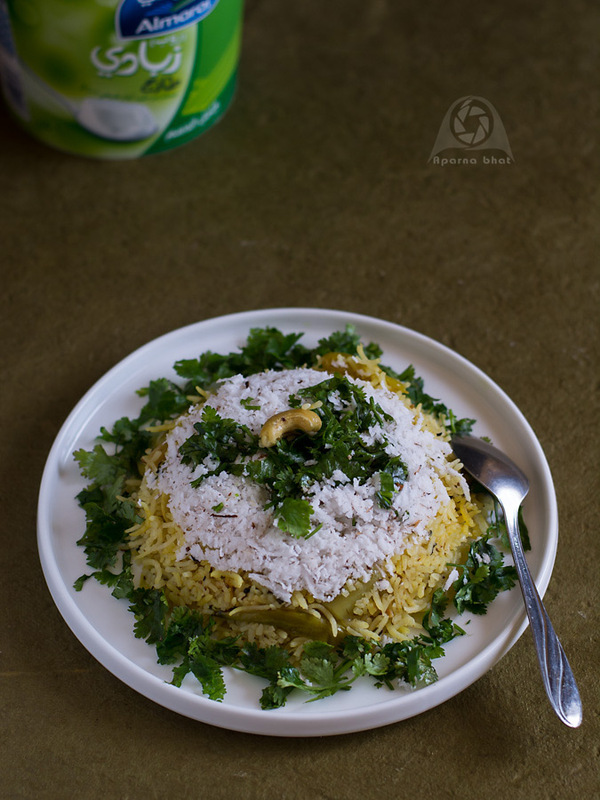 Today, I note down the recipe of Masale bhaat which is traditional veggie rice prepared in its own way in every Maharashtrian house especially for special functions and weddings. It’s a no onion recipe and hence can be prepared during festivals too. Recipe adapted from recipe book "Annapurna" by Mangala Barve. 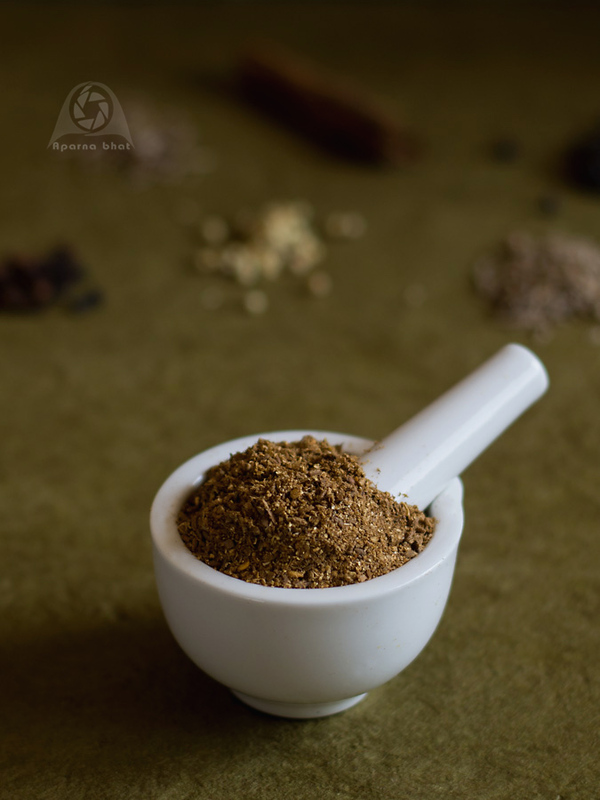 Dry roast coriander seeds, cumin seeds, shahjeera, cloves, peppercorn and cinnamon separately. Keep them aside and once cooled powder it in mixer jar or with a mortar and pestle. Wash and drain the rice for 30 mins. In a pan heat oil and add mustard seeds. Once the seeds splutter, add slit green chillies and stir fry. Now simmer the flame and add turmeric powder and asafoetida. Stir it continuously for 30 secs. Next add chopped coriander leaves and chopped vegetables and saute it for 2 mins. Add salt according to taste. Then add the drained rice and fry for another 1 min. Next add 1 and 1/2 tbsp of ground spice powder, garam masala, red chilli powder, cashews. Stir it for few seconds. Add water (double the quantity of rice), whisked yogurt and sugar. Mix it well. Once the water comes to boil close the pan with lid and cook on medium to low flame till rice is done. 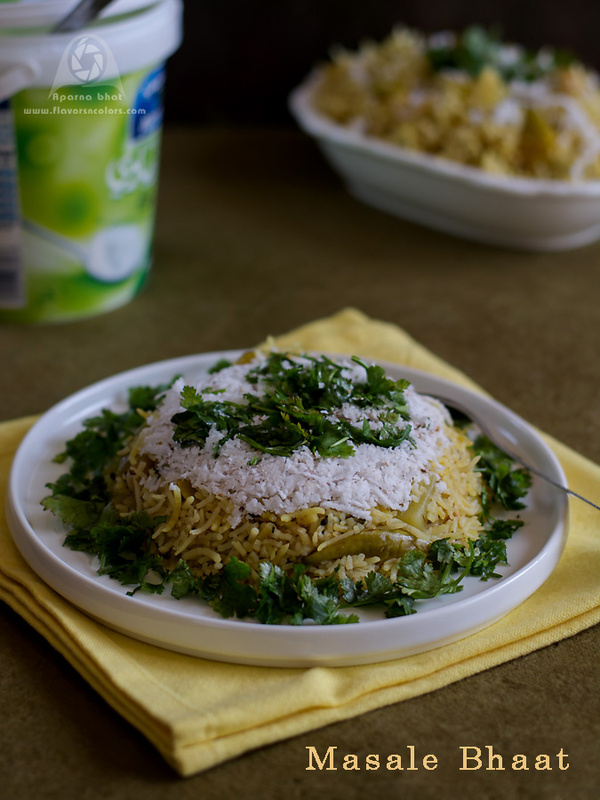 Serve it hot garnished with freshly grated coconut, finely chopped coriander leaves and a generous dollop of ghee. Enjoy it with plain curd / raita or any other accompaniment of your choice. Vegetables like eggplants, green peas and cauliflower can also be used while preparing this rice. You can prepare this rice in pressure cooker too. Pressure cook for 2 whistles, simmer the flame for 5 mins and then switch off the flame. Allow it to stand for 10-12 mins before you open the lid. This dish turns out to be spicy so adjust the spice levels as per your preference.